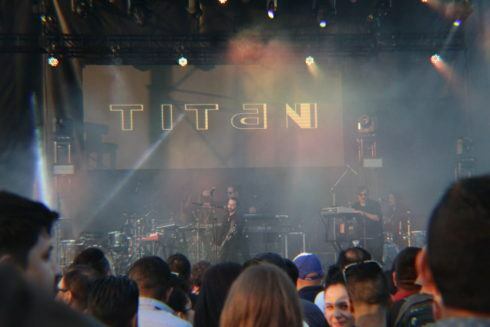 Chicago, Illinois– This past weekend, July 7th – 9th, the third presentation of Ruido Fest 2017 took place at Addams/ Medill Park in the Pilsen district. 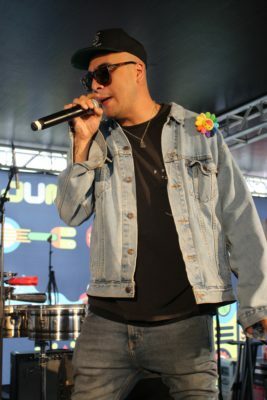 Ruido Fest continues to be a unique 3-day music festival curated for Latinos by Latinos celebrating the diversity en la musica of Latin alternative. 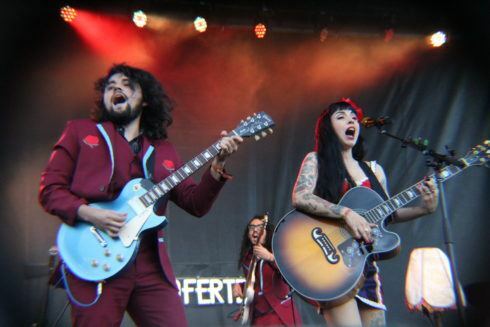 With that in mind, this year’s lineup had diverse presentation of artist boasting bands like Cultura Profética, Molotov, y Intocable as the festival’s headliners. Last year’s lineup was a tad bit on the reggae side, amusingly this year was more electronica influenced. 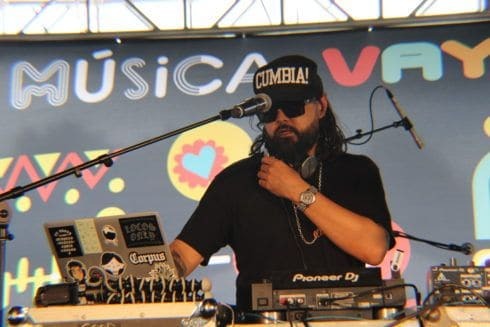 Day 1 lineup showcased the diversity of electronica found within the genre –alternativo en español- from the hard bangerz DJ set of Happy Colors to more established bands like Titan offering a glimpse of electropop to indie bands like Clubz. Perhaps this led to a more diverse crowd. 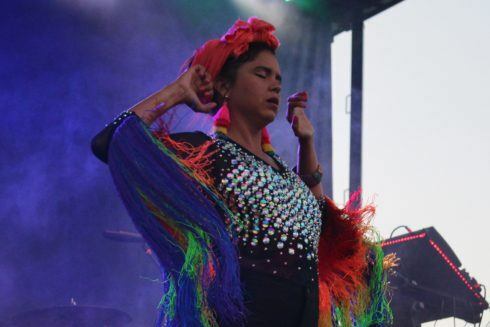 Bomba Estereo ‘s new growing international fan base certainly did. 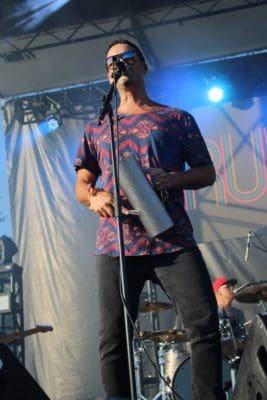 Of Friday’s performances, Gepe was a gem within the lineup for Day 1. Of the new acts that I discovered this year, I was blown away from Sotomayer‘s set. 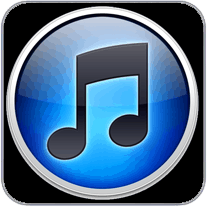 Sotomayer’s music was enticing almost like hearing a siren sing. Musically, this duo shared a similar chill tropical electronic sound to that of Bomba Estereo whose tracks like “Algo Está Cambiando” and “Raíz” showcase this vibe. Although this band is still growing their fan base, I can definitely see them bringing some attention to Latin electronic. 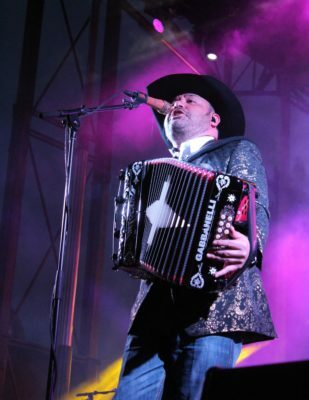 This year Toyota, returning Ruido Fest sponsor, had the opportunity to host their own stage. 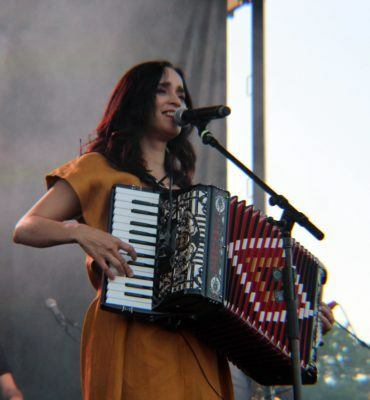 Their selection of Latino Americano artists intrigued me the most for this year’s lineup for two reasons: the artist where either Latino Americano / bi-cultural, and they were rising artists breaking barriers in their respective genre. Victoria La Mala, self-described as the would be daughter of Tupac and Selena, is creating a lot of noise as a mujer in the Mexican regional scene. She gracefully is able to bounce from a banda song like “Vete Mucho” to a Spanglish pop cover “Love Yourself”. Ella sencillamente captivo el audiencia during her acoustic presentation. Los Chinchillos del Caribe from Puerto Rico were another nice surprise from this lineup. 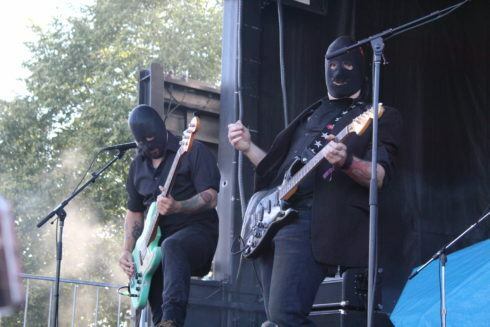 They were eye catching from their mascaras to their lively energy on stage. With their mixture of rock y cumbia and rap flow, it slightly reminded me of the Kumbia Kings but much more intense on the cumbia y less pop. Another artist bringing the heat from this lineup was El Dusty. Grammy nominated artist brought a perfect blend of Latino diaspora within his DJ set. He really knows his music, flawlessly mixing musica from Los Tigres to Selena to reggaetón to El General to J Balvin’s new hit “Mi Gente”. And that’s only scratching the surface because we haven’t even mentioned La Santa Cecila nor MLKMN’s sets. Overall, Toyota did a great job on their artist selection showcasing the latest groundbreaking artist and I’m excited to see their stage next year. 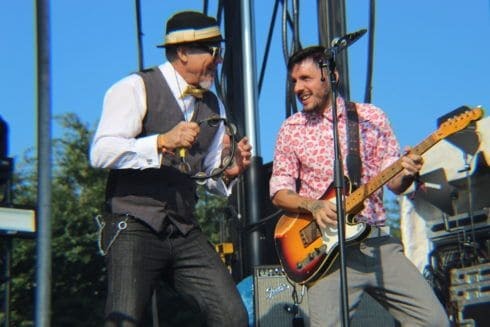 Throughout the 3-day festival there was a fine balance between rock y electronic bands. Saturday, Day 2, had a nice rock beginning with indie bands such as Las Piñas y Los Nastys. 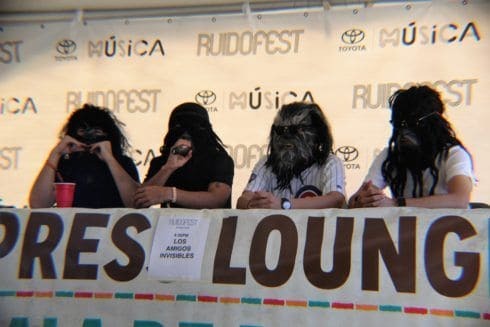 The Wookies, a disco techno band from Mexico City, brought the boogie to the stage. Sensualmente El Guincho took us into a summer paradise with his smooth electronic vibes. These performances brought about a nice escape from Chicago’s summer heat. Silverio, a veteran to Ruidofest and now dubbed as el Padrino [the godfather] by the the festival organizers, trajo lo crazy to this weekend’s festivities. This time the festival organizers were prepared for the madness that he would provoke and provided him with a net to protect him from projectile objects launched by the crowd. Instantaneously, his set created a mosh pit that would rival any mosh pit at a rock concert. 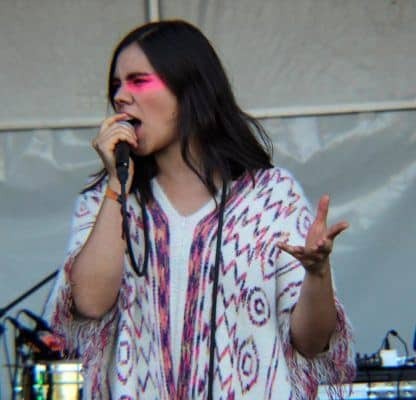 Nothing but good vibes continued from sets like Chilean artist Javiera Mena, indie artist Wet Baes with their surprise performance along Clubz, and Los Amigos Invisibles to carry los ruidosos through the evening. 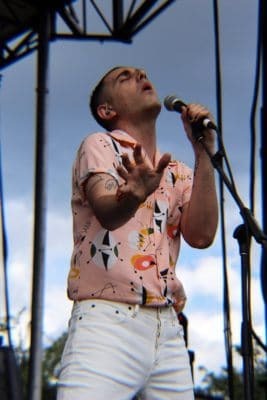 Highlights from Day 3 included Alex Anwandter‘s magical performance. He moved to the musical frequency like some kind of nymph. 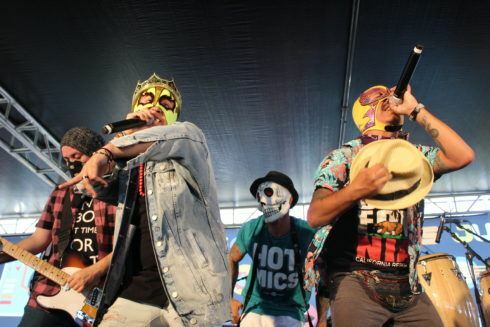 Off all the artists, Victimas del Dr. Cerebro kept it lit with their energy and theatrics. It’s been 4yrs since they’ve been in the USA y se nota that they were missed. Todos andaban de locos bailando, brincando, saltando, y cantando. Fobia was a great throwback. There is nothing like rocking out to your favorite 90’s band. “Hoy tengo miedo” was a crowd pleaser among others. I can see the intention of having Mon Laferte, alternativo’s current “it” artist, perform before Intocable. She set up the atmosphere with her jazzy retro sound with folk influences. It was a nice seaway that was necessary for Intocable a Norteño band. Despite trying to keep the lineup more diverse this year, it felt like there was less people to see Intocable then there was for Molotov. Overall, Ruido Fest had another great turnout. Among the crowd there were mixed feelings about this year’s overall lineup pero lo que sucedió left the doubters talking. Ruidofest 18 ay nos vemos!?! Para mas fotos de Ruido Fest chequen el foto essay. Visit Ruido Fest for the complete day-by-day lineup. On-air, I go by the name of Kydd Sasquatch. You can catch me playing all your Latin favorites and soon to be favorites on my show called ‘Pico De Gallo’. I’ll make sure to get keep you in the loop en everything alternativo. 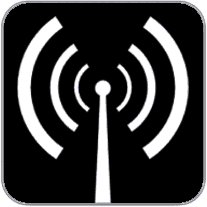 Asi que no se lo pierdan, solamente en 90.5fm KSJS!